It's a month on from lifting the World Cup with the girls, in front of a full house at Lord's, with 180 million people watching worldwide on TV. Crazy! What a special day it was - I've had the chance to relive the final many times since, hearing so many lovely stories of how and where people watched the game. My favourite stories are the ones of kids imitating us, whether it be a young girl practising Anya Shrubsole's celebration or Nat Sciver's sweeps. It's stories like that which make you realise it wasn't just a win for the team. It was a win for women's cricket, a win for everyone who came before us - for 105-year-old Eileen Ash who rang the pre-match bell, for the late Rachael Heyhoe Flint who was the reason we were playing at Lord's - and it's also a win for the generation that will come after us. Looking back on the day and all the emotions that came with it, it was all actually a bit of a blur. The last 10 overs of the game were probably the moments I remember most clearly. With India 190-3, I think a small voice crept in saying, "It's not our day". I remember pushing it aside… not with this team, not with how far we'd come and how much fight we've got. We knew one wicket gave us a chance and we just needed to hold our nerve. It was so tight and I knew how big every decision I had to make was - the bowling changes, the fields, what I said to the bowler. That focused me and in a weird way made me calm, there was no room not to be. I bought Anya back on thinking I'd give her a little bit of a burst and maybe bring Katherine Brunt back on to hopefully finish the job. But Anya's first two balls went for four, and I started doubting if I'd made the right call. She then took the key wicket of Punam Raut two balls later - "Maybe not", I thought, "one more over". I went over to chat to Anya before that over to check she was clear. She had no interest in having a chat, she just wanted the ball and to charge through them. I'd seen her in that sort of mood a few times before and they had all ended well for England. After that, it all happened so quickly. Anya took that final wicket and that was it, we were world champions! What a hero! The roar from the crowd was something I'll never forget. I'd tried to blank out the noise for most of the day and focus on doing my job, but at that moment it was like the volume was turned back on and ramped up a hundredfold. Seeing the look on all of the girls' faces and knowing what they'd given to be there and the journeys we'd all been on was unbelievably special - there were a lot of tears. We've had a lot of hurt in World Cups and that made lifting the trophy even more special. The celebrations involved a good stint in the dressing room with all the staff who had been instrumental to our win and the girls that didn't make the World Cup squad. I even managed to get Anya's name on the MCC honours board, albeit briefly! It was great to have all our family and friends there to share the celebrations too. My best mates, complete with Heather Knight facemasks, even made it onto the back pages of a few newspapers the next day, which they were delighted with. It's fair to say the week after the final was quite a manic one. It was up The Shard at eight o'clock the next morning, followed by team photos and media at Lord's as well as a training session with some little kids from the ECB's All Stars Cricket programme. Then I was off to the BBC's London studios with our coach Mark Robinson for a whole host of interviews into the evening. On the way up to Manchester to film A Question of Sport a few days later, I had a bit of a shock at Euston station as I saw the winning moments being replayed on the big screen there. I had to put my head down and hope no-one noticed the massive grin on my face and twigged that it was me smiling like a Cheshire cat on the big screen too! It was a slightly surreal moment. I finally managed a few quiet moments with some mates at the men's Test match at The Oval later in the week. After I'd visited the commentary boxes with the World Cup trophy, I settled down to watch the cricket, with the trophy box being guarding by a member of the Oval security team. A few Pimm's later, I had a call from our media manager checking on the whereabouts of the trophy. I told him it was all under control, but little did I realise the security guard had been guarding an empty box! Although a mad panic followed, the trophy was located soon after, luckily in the hands of an ECB employee. It's crazy to think of the reach that the final had and I really hope the amazing success of the tournament isn't a one-off but instead is something to build upon. When I made my England debut seven years ago, I never imagined I'd play in front of a sell-out crowd at Lord's. Who knows where the game will be in seven more years? Super bolognese for Super League? I decided I'd be chef for the team on the first night and promptly regretted my decision as I realised that cooking spaghetti bolognese for 15 without a big cooking pot is a nightmare. Luckily we were able to improvise and even West Indies captain Stafanie Taylor was impressed with her first ever spag bol! We didn't start our campaign in the fashion we wanted, but we've played some good cricket since then and we've got a must-win game at Bristol on Saturday to hopefully get us through to Finals Day at Hove next Friday, 1 September. A few people have asked me how the team can stay motivated after winning the World Cup. With the Women's Ashes being less than two months away, that's a pretty easy answer. What a year it would be if we could get our hands on that Ashes trophy too. It feels like there's so much room for growth for this group of players, we're nowhere near the finished article and it's exciting to see where we can go next. Having had a taste of silverware, I definitely want some more. 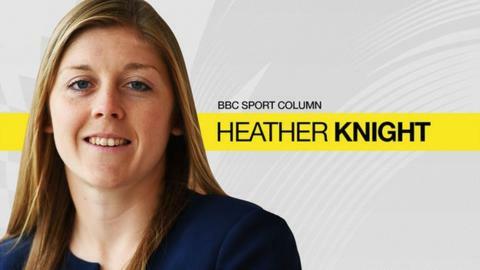 You can listen to commentary on Super League Finals Day on Friday, 1 September from 14:00 BST on BBC Radio 5 live sports extra, with in-play highlights and text commentary on the BBC Sport website & app.